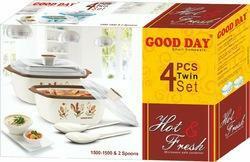 Leading Manufacturer of hot & fresh microwave container twin set from Vapi. Since our commencement, our firm is engaged to introduce a premium quality array of Hot & Fresh Microwave Safe Container 4 pc Twin Set. The offered set is made of 2 Pc 1500 ml microwave safe container & 2 serving spoon.